BitTorrent is one of the best ways to download large files. However, unlike common HTTP or FTP downloading, it requires settings to work well with specific connection. Luckily those are easy to calculate if you have correct starting point. Torrent is peer to peer protocol . Files are split in multiply parts and every person downloads by exchanging those parts with others . Speed of your download is partially affected by how fast you are uploading. upload too fast and you will choke your connection and hinder download speed. Download and upload speed are two things that you should know before playing with settings, they are actually those speeds that you pay your provider for. Depending on technology you use to access Internet they may be equal or different (usually with upload speed lower). 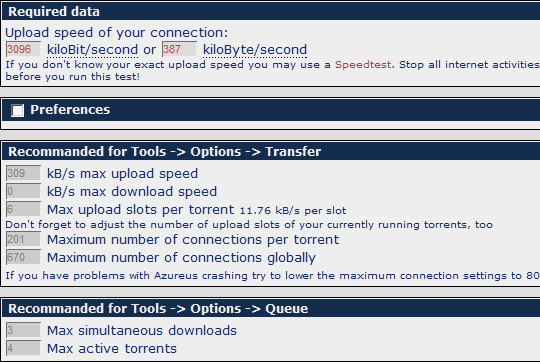 All [decent] torrent clients have common settings that should be determined and set according to download and upload speeds. number of active torrents – how many torrents can be active at the same time, too many will choke connection. Easiest way I know to calculate those settings is online upload settings calculator . It is very easy to use – just input your upload speed (actually more important for settings than download one) and it will calculate best settings for your connection. Just beware that torrent working too fast with optimized settings can hinder other tasks, check my post on preventing downloading from hindering browsing for tips to deal with that.